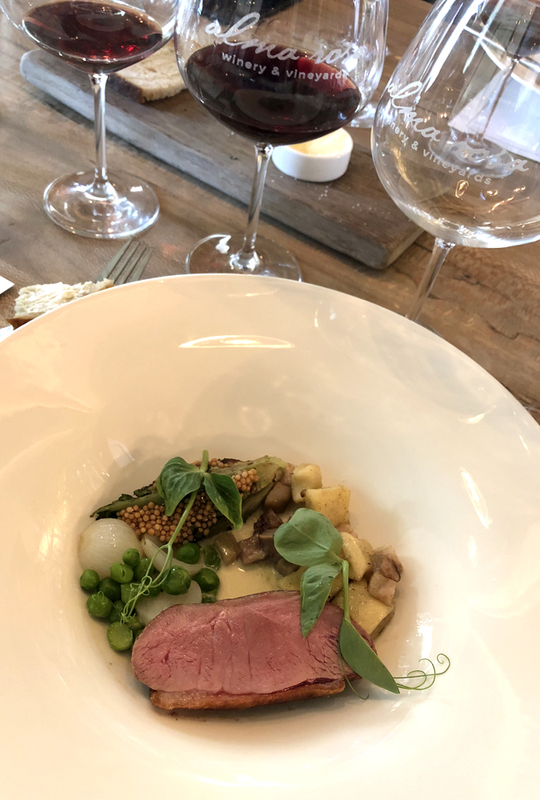 So it was a great honor to be invited to spend a media lunch at his El Jabalí Vineyard where he now makes Alma Rosa Wines with head winemaker Nick de Luca, who also joined us for the event. And the few hours made it very clear exactly why his wines are so delicious--because when you drink them, you drink history. "I'm approaching fifty years as a wine grower," he told us at one point, and then half-joked, "It scares me." 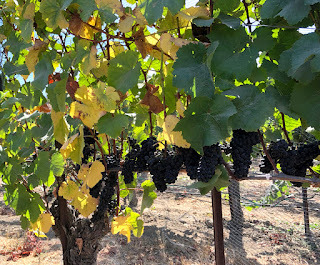 But then he put his El Jabalí Vineyard into such a long context it seemed like a story torn from a James Michener novel. He told tales back to the land grants, but mostly from the 1970s on when he arrived in Santa Barbara County after his time in the Vietnam War and turned to the land and farming for refuge and peace. "In the 1970s you could still dry-farm garbanzos here and it would have made sense," he said, "but not anymore--the land's too expensive." So instead you have the beautiful growth of these 37 year old vines. Getting to chomp on some of the grapes you taste why the wine is so delicious--the flavor is all there waiting already. (The grapes were less than a week away from getting picked.) "The leaves are turning just at harvest," Sanford pointed out. "That's what they want. Chemically forced vineyards are too happy. Nature wants the plants to settle down." 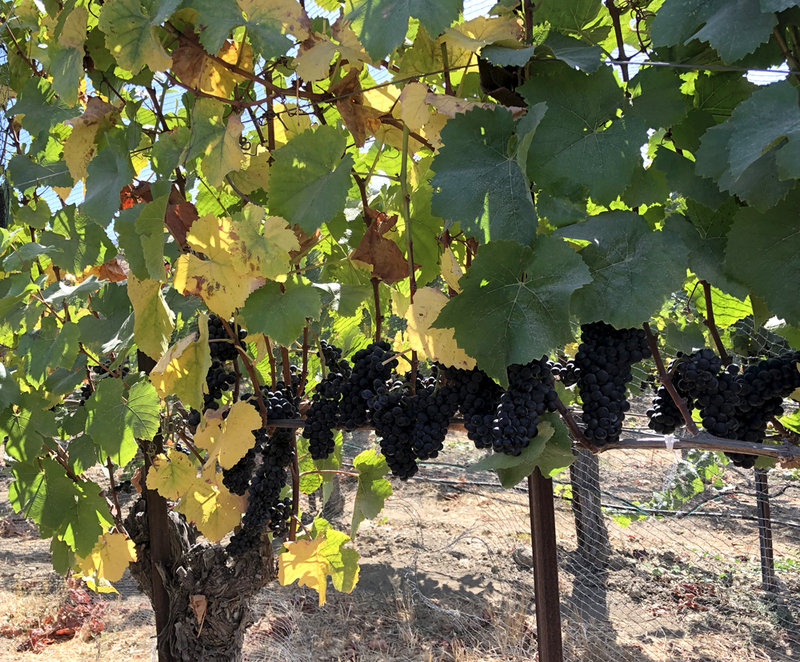 He and de Luca were particularly proud of their shift to the Simonit & Sirch method of pruning, an Italian system that is much more precise and delicate than most typical U.S. pruning regimens. "All the pruning removes outer shoots, so we don't interrupt the sap flow," he explained. "The lifespan of vines is greater pruned this way. And with age, you get an elegance to the wines." Of course, in addition to discovering this most delicate of pruning systems, Sanford has been farming organic before anyone thought to make it a marketing term. Part of that was a desire to be very kind to the land after the horrors of a war that thought napalm was a wise weapon, but it was Richard's wife Thekla who made the push. 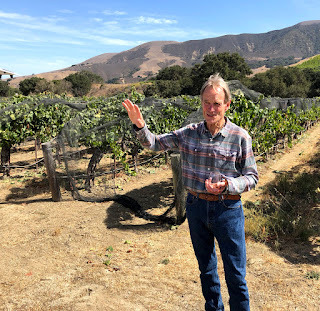 "It took two years, and we had to be innovative," is how Sanford describes the process, telling a story of the vineyard crew blasting bugs off the vines with flames, not poison, during one infestation. Add it all up, and de Luca points out, "When we have healthy grapes, we can use little to no sulfur." He quickly insisted, "But we're not making natural wine. It all comes down to hygiene. If I knew I was going to have a major surgery, I'd want it on the floor of winery." Just to focus on two of the enlightening wines shared with us that afternoon, I'd like to write about the 2011 and 2016 El Jabalí pinots. The older wine was aging well under screwcap, for as Sanford insisted, "It's a wine of the people." He delighted in the "forest floor that develops with age" and the translucent color, citing Michael Broadbent telling him, "Richard, you sohuld be able to read a newspaper through a good Burgundy." Turns out the news you can read through it is a review praising its grace and still plenty of fruit seven years after release. Sanford accurately said, "There's a lyrical quality to these wines that lasts," and then he slowly drew his hands apart to emphasize his point. Meanwhile the wine slowly set out taste buds at attention. The just released 2016, on the other hand, was ridiculously delicious given its youth. de Luca said El Jabalí was always their most tannic wine, so they massaged it with oak. He shared a line from a French friend about barrel-aging, "If the wine is so good, why are you afraid?" Alma Rosa isn't, so this pinot gets up to 50% new French oak, but it's integrated well, helping with structure but not tasting like you've bit a barrel in the least. Oh, and if you're going to be drinking wine this good, you better have suitable food to match. Fortunately the lunch was catered by First & Oak, with Executive Chef JJ Guerrero himself making our meal. Here's the main, a breast of duck (my guess would be sous vide first, then pan-roasted? ), with English peas, charred romaine filled with mustard seed so it seemed to be a whole new plant, pearl onion, gnocchi, and a mint velouté (you know, one of the mother sauces). We're pretty lucky to live where we do, you know.